Although Ohio bicyclists are not banned from using sidewalks under state law,, many voluntarily choose to utilize bike lanes or are required to do so by a local city ordinance. While this can help ensure that cyclists are visible to drivers and can prevent accidents between cyclists and pedestrians, it does leave cyclists open to collisions with vehicles. Dooring accidents, for example, in which a driver who is parked on the side of the road opens his or her door into the path of an approaching cyclist, are not an uncommon occurrence. While many cyclists are lucky enough to walk away from these types of accidents with minor abrasions or a few bruises, others are not so fortunate. Cyclists who were traveling at high speeds prior to a collision are particularly at risk of sustaining life-altering injuries, such as head trauma or spinal cord damage. Fortunately, cyclists who are injured in this way may be able to collect compensation for their injuries if they can demonstrate that the driver was primarily at fault for causing the accident. To learn more about filing your own claim, please contact one of our experienced bicycle accident attorneys for a free case evaluation. 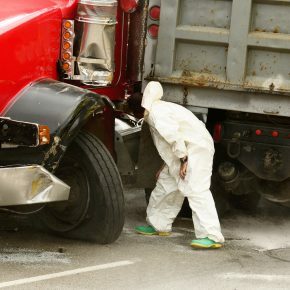 Determining who is liable for a dooring accident depends on a number of factors. For instance, the driver who opened the car door without first checking for an approaching cyclist is usually held at least partially liable for resulting injuries. However, bicyclists are also required to act reasonably when riding, so a cyclist who darted out from between two cars before colliding with the driver’s open door could also be deemed partially at fault for the accident. Fortunately, this does not mean that the injured party would be barred from recovery, as Ohio is a comparative negligence state. This means that the injured party can still collect compensation for a portion of the damages, although the amount will be reduced by his or her own percentage of fault. The only time an injured party would be barred from recovery is if a court determined that he or she was more at fault than the defendant. Avoiding routes with heavy traffic. Taking these precautions does not guarantee that a cyclist will not be injured in a dooring accident, but it can go a long way towards reducing their chances of being involved in one. If you or a loved one were injured in a bicycle accident, please call 419-241-5500 today to schedule a free case evaluation with one of the dedicated bicycle accident attorneys at Lafferty, Gallagher & Scott, LLC.